1 What is a Bench Press? A bench press is probably one of the mot famous exercises among meatheads. At any given point, you will see someone with an overdeveloped chest loading a barbell with heavy plates. If you continue watching, you will see this fabulous meathead perform the bench press for far too many sets at hypertrophy reps, just to prove a point. But he’s not wrong: the bench press may be one of the best exercises for developing your pectoralis major. So how do you perform a bench press? Ultimately, it’s pretty straightforward. You un-rack the barbell, lower it, and then press it back up. However, most people perform this simple exercise wrong. So let’s talk about how not to perform it wrong so that you can outshine those meatheads in the gym. If you’ve seen a photograph of a professional powerlifter benching such as their back is arched. And no, it will not hurt them. Arching your back is one of the key components of a bench press, and the lack of it is why most people perform it incorrectly. If you want to look like Bradley Martyn, read this full article below. For starters, it does look painful. Some individual’s arch is so pronounced that they appear to be bending in half. However, the thoracic spine can naturally bend that much in some people. Really, the degree of your arch is fully dependent on your individual back mobility. However, no matter how immobile your back is, it should still be arched. It emphasizes the chest. Anytime you set up for a chest exercise, your chest should pop out. This allows the arms to have a larger range of motion to really target the chest. Pressure applied to the upper body actually travels through the back first, so stopping without moving through the full range of motion will halt the pressure of the exercise. And no one wants to bench for rear delts. It locks the shoulders in place. Along with emphasizing the chest, arching your back allows your entire scapula (or the shoulder blade) to lay on the bench. Keeping your shoulders locked in place will prevent your upper body from moving around during the lift. This is paramount because you want the pressure to remain above your chest at all times to prevent injury (and working the anterior deltoids instead of the pectoralis major). It retracts the scapula. When benching, you don’t normally think of your scapula at all. In actuality, the pressure comes from the scapula. Retracting your scapula before each set also helps to lock everything in place so that the bar comes down to the sternum, which is what you want. Keeping the bar in line with the sternum allows for maximum chest activation. So please, ignore those meatheads in the gym who say that you should not be arching, because you should be. Your bench will improve tenfold and your chance of injury will quickly diminish. You can also practice retracting your scapula while standing. Hold a dowel in front of your body, hands a little wider than shoulder width. Roll your shoulders down and press your chest forward, retracting your scapula. You should feel immense pressure from your upper back. Then bring the dowel close to your sternum. Remember to pull through your back, though. It’s weird, but you’ll feel it in your chest. I promise! 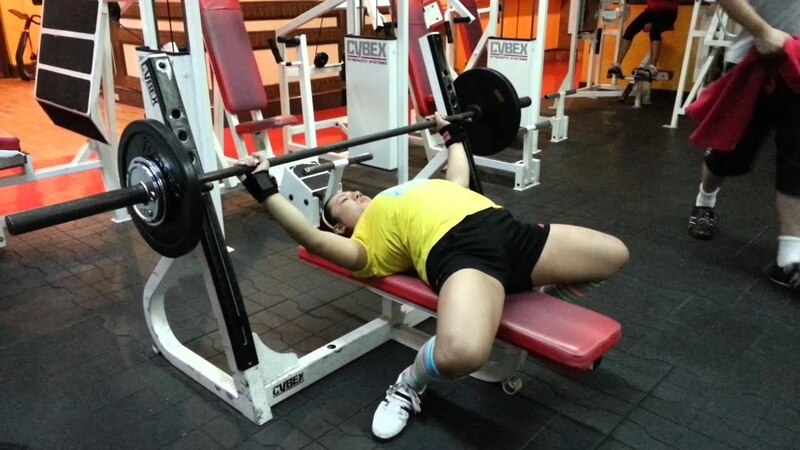 Again, no one really pays attention to their feet when benching. However, feet placement can make or break a good bench. Keeping your feet flat on the floor wherever they may can actually set you up for disaster, and here’s why. Much like you don’t want your shoulders to move when benching, you want your hips to be immobile, too. However, when your feet are haphazardly placed they will not support the hips. The heavier the load, the more the hips will want to move. This results in instability near the chest (even if the shoulders are braced against the bench). It may lead to injury. It’ll definitely lead to insufficient gains. The trick with your feet is to bring them as close to the upper body as possible. When setting up, think of placing your feet as close to your head as possible. You will go up on your toes. You will feel ridiculous. However, by doing this you are locking your hips into place. Your entire body is rigid, save for your arms. Now, you can bench without fear of dropping the weight or moving around too much on the bench. This is dependent on the person and what their goals are. If you are training more for inner chest and triceps, then keep your hands closer than shoulder width. This allows for a smaller range of motion and keeps your triceps locked in place. The pressure of the bench will target these muscle groups specifically. However, don’t be flashy: keep the weight much lower so that you can handle it without injury. If your goals are to develop your outer chest, keep the hands a little wider than shoulder width. This ensures a fuller range of motion so that the entire muscle is firing. It will still target the triceps and inner chest but more indirectly. For this stance, you can up the weight to something heavier but still just as manageable. However, both of these variations should still have the same set-up. Keep your shoulders down and locked and your feet up toward your midsection so that your entire body remains immobile. This ensures the best bench! Great, now you know how to set up for a bench press. In actuality, setting up is the hard part. It’s also the part where most people fail. Often times, individuals will keep their shoulders splayed on the bench and their feet placed wherever, which is a calling card for disaster. While they may be making some strength gains, they are not maximizing their efforts. They’re also more prone to injury. So don’t be that guy. Now you know better! So let’s actually perform the exercise. Set up for as long as you need. (Personally, I wait for the drop in a song to get pumped up enough to tough out a couple reps.) Just make sure your hands are equidistant on the bar to avoid imbalances. When you’re ready, take a deep breath in. Toying with your breath is actually a great muscular indicator. It signals to the muscle that it’s time to work because it’ll tense up due to restricted air flow. Releasing your breath allows the muscle to relax; use it on the eccentric movement. Unrack the barbell (or have a spotter un-rack it for you if you’re going heavier) and slowly lower down. The bar should either touch or come within an inch of the sternum. Exhale and press the barbell back up until your arms are fully extended. Continue in this fashion until you feel your arms about to give out. Make sure that you don’t pause for too long in between reps. This will tire out the muscles without them doing any actual work. And there you have it, the mechanics of a bench press. The actual movement is basic and straightforward, which is why it attracts so many meatheads. It doesn’t have as many difficulties as a squat, and much less than a deadlift. It also recruits a significant amount of muscle fibers from the upper body — the pectoralis major and minor, the triceps, the biceps, and the upper back — which shuttles it into the “compound movements” category. But now you know better. You know that a bench press also requires a significant amount of time setting up — sometimes longer than the press itself. But when done correctly, the bench press is one of the best movements for overall chest development. So if strength gains are in your future, definitely add the bench press. You will not be disappointed. Diverticulitis Explained 2018 -How to treat?